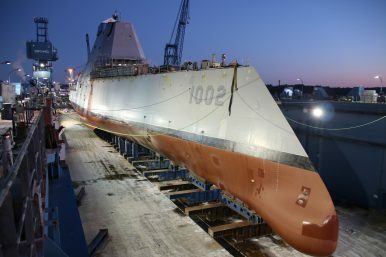 The future USS Lyndon B. Johnson (DDG 1002), the third and final ship of the Zumwalt-class – the U.S. Navy’s largest and technologically most advanced class of guided-missile destroyers — was launched at the General Dynamics Bath Iron Works (BIW) shipyard in Maine on December 9, according to Naval Sea Systems Command. The third Zumwalt-class guided-missile destroyer was officially laid down in December 2017, although construction of the ship already kicked off in April 2012. In 2015, the U.S. Department of Defense briefly considered abandoning construction of the last Zumwalt-class as a cost saving measure. However, the plan to scrap the Lyndon B. Johnson was quickly abandoned after it became clear that cancelling the destroyer might end up costing the U.S. Navy more than continuing construction of the 16,000-ton warship. With a cost of $800,000 to $1 million per Long Range Land Attack Projectile (LRLAP) round, the precision ammunition has become too expensive for the service. LRLAP is the only ammunition specifically designed to be fired by the USS Zumwalt’s two 155 millimeter/62-caliber Advanced Gun Systems (AGS), the main armament of the ship with an estimated range of up to 63 nautical miles (72 miles, 115 kilometers).